When examining up-and-coming food trends, it becomes clear how large, overarching trends in foodservice give rise to smaller trends within many facets of the industry. Informed, health-conscious, experience-seeking consumers are keeping chefs and operators on their toes and rewarding those who deliver creative and topical offerings. Here are 10 key food trends to watch in 2018. The blurring line between dayparts is leading to increased interest in non-traditional breakfast offerings. In response, recent menu development is reflecting “morning flavours later in the day and vice versa,” says Charles Winship, senior Research analyst, Consumer Insights at Technomic. “There has been more growth in ethnic flavours for breakfast…At breakfast, there has just been greater emphasis on menu innovation.” This trend is also being shaped by health-conscious consumers and interest in plant-based fare — think grain bowls, smoothie bowls and congee-inspired porridges. The fact that consumers increasingly want access to all things at all times is shaping the foodservice landscape. This is perhaps most apparent with the popularity of all-day breakfast offerings, which currently shows no sign of slowing. Consumers are also practicing “more purposeful” snacking, notes Winship. “This kind of attitude is eating away at [the mindset that] I eat this type of food at this time.” Such attitudes are blurring the lines between dayparts and causing lunch and dinner menus to shrink while breakfast offerings grow. The weakening of defined mealtimes is also driving the popularity of small plates and dishes designed to share. This erosion is further fuelled by consumers’ increasing willingness to drink their calories. McCormick’s 2018 Flavour Forecast identified purposeful, wellness-focused beverages such as “breakfast boosts” and “snacking soups” as a key trend for 2018. The popularity of vegetable-focused offerings continues to be influenced by informed consumers concerned with health, environmental sustainability and the ethical treatment of livestock. This phenomenon is no doubt what led to veggie-centric cuisine ranking among the top-10 up-and-coming trends in Restaurants Canada’s 2017 Canadian Chef Survey. According to Technomics‘s 2017 Canadian Centre of the Plate Consumer Trend Report findings, “roughly two-fifths of consumers say they’re eating vegetarian options more often than two years ago,” says Winship. The increasingly multicultural nature of the Canadian population is also helping propel this trend. Many cultures have been practicing vegetable-focused cuisine for centuries, so don’t overlook global flavours as a valuable source of inspiration. Dessert is stepping out of the post-meal shadow to become an attraction in its own right. “At La Banane, people come specifically for the Ziggy Stardust Disco Egg, (above)” says Brandon Olsen, executive chef/owner of the Toronto restaurant. Olsen attributes this phenomenon to the filled-chocolate confection’s visual appeal and interactive nature (the egg is meant to be cracked open to reveal its contents). Both Olsen and Palghadmal agree social media is playing a notable role in driving interest in unique dessert offerings. Operators are taking a closer look at the amount of food waste produced by their establishments. Though always a cost-related concern, public interest in sustainable practices is putting greater pressure on foodservice operations. “[This] is a good trend in that it’s aligning operator interests with consumer interests,” says Winship. “And, from a brand perspective, you have the ability to improve your profit margins and your brand image at the same time by it.” This issue can be dealt with in a variety of ways, including menus incorporating trash-to-table techniques, preparing items to order and participation in food-donation programs. Toronto-based start-up Flashfood even connects restaurants and grocers with customers to facilitate the sale of surplus food at discounted prices. With members of the next cohort of foodservice professionals graduating from programs that have begun focusing on waste-reduction practices, expect to see this trend continue to gain steam. “[Consumers] want to see sustainable practices in the business and that’s what people are standing for. 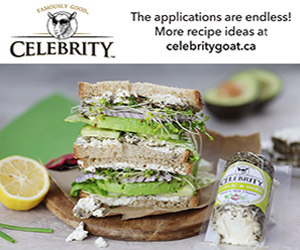 It’s the way industry is trending at this point,” says Kelly O’Brien, manager of Operations, W. Galen Weston Centre for Food, Durham College. Focus on local cuisine has increased interest in urban farming. A growing number of chefs are sourcing produce from local urban farms, or even tending their own gardens in order to supplement — or even fully sustain — their menu offerings. Further, The University of Guelph’s Local Food Innovation Symposium pointed to vertical farming as a growing trend/industry that will contribute to more local produce — and more local food year round. On a smaller scale, chefs are also making use of indoor-farming technology, such as urban-cultivator systems, to ensure a year-round supply of herbs and greens. Canadian diners are seeking out new and exciting experiences, pushing operators to continue their search for the next hit flavour. Ethnic condiments offer an approachable entrance into myriad traditional cuisines for both the consumer and the operator. Demand for ethnic condiments is also influenced by interest in spicy flavours. “Ever since sriracha exploded, there has been this ongoing hunt for the next sriracha,” says Winship, who points to harissa, sambal, serrano and piri piri as spicy flavour to watch. McCormick’s 2018 Flavour Forcast also highlights East African barbecue marinades and sauces as flavours expected to experience increased popularity this year. According to Technomic’s 2017 Canadian Future of FSR Consumer Trend Report, more than two-fifths of full-service restaurant consumers indicate the importance of made-from-scratch items at full-service restaurants. Though the trend towards scratch-made and in-house-made offerings has been impacting the foodservice industry for quite some time, many Canadian chefs are taking things one step further. Taking cues from the past and traditional techniques, interest appears to be growing with regard to in-house fermenting, curing, preserving and pickling techniques. In fact, fermenting ranked fifth on the Restaurants Canada Canadian Chef Survey’s up-and-coming trends list, while “back-to-basics” cooking came in at ninth place. Although this trend received significant attention throughout 2017, activated charcoal continues to make its way into new products and applications — turning everything from beverages to pizza and confections a dark, ashy hue. The popularity of this ingredient is due both to its supposed health benefits and the unique appearance it gives the products it’s featured in. Palghadmal recently featured L’éclair Noir among its seasonal offerings. The activated-charcoal éclair featured whipped activated-charcoal ganache, cassis (black currant) mousse and cassis compôte ($7). A focus on local ingredients and development of Canadian cuisine have given rise to this next trend — Indigenous-inspired cuisine. Chefs’ exploration of terroir and native ingredients would lead them to techniques and ingredients used by Canada’s First-Nations peoples — not to mention growth in First-Nations-owned restaurants such as Toronto’s KuKum Kitchen and NishDish, as well as chef Rich Francis’ upcoming restaurant, Seventh Fire, in Saskatoon. “This cuisine really hits at two key trends right now — demand for ethnic foods and interest in local and domestic ingredients,” says Winship.